The middle of May had arrived and with it what looked like summer and my first holiday of the year was just a week away. I said goodbye to everyone in work on Friday, 'see you in a week', they were a little surprised to say the least when I turned into work on Monday. The weekend weather forecast was not too good so I thought I would delay the trip out to the west coast till Sunday afternoon or Monday. The detailed weather forecast on Sunday revealed a return to autumnal weather for the week ahead. 'Nay problem' I thought I'd put off my hol's for a week. So returned to work and re-arranged my time. Friday night came at last so I got myself ready for an early start Saturday morning. The weather seemed to have 'dramatically improved' we were looking a 'sunshine and showers' for the weekend ahead and the early part of the following week. So I got myself ready for an early start on Saturday morning to go looking for the sunshine and try to avoid the showers. The first slight hiccup came courtesy of a phone call from Stephan at 5.30am just half an hour before I was due to pick him up. Not feeling to good and after not having slept much through the night he decided that it would be best if he could follow me on and meet up in a couple of days time. So after throwing everything I needed and probably much more into the car I set off. I made good progress over to Crianlarich and up to the Bridge of Orchy, stopping briefly in Aberfledy for a bite to eat, a couple of tasty sausage rolls. Frequent rain showers were trying to dissuade me from putting on my hiking boots but after driving on further and into glen Etive things were looking up, the rain had stopped and there was just a little mist covering the mountaintops. After choosing my route and donning my walking gear it was time to stretch my legs. The route chosen should have taken me over the river Etive just up stream from were I had parked the car, but this was proving difficult, after all the rain the river was pretty swollen, I ended walking the 3 km back to the main road to use the bridge. 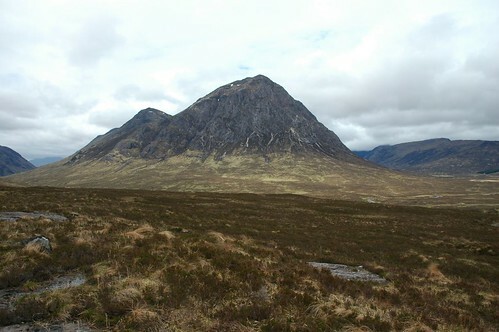 Some nice views of the impressive Buachaille Etive Mor kept me company as I crossed some boggy moorland to gain the lower slopes of Meall a' Bhuiridh. 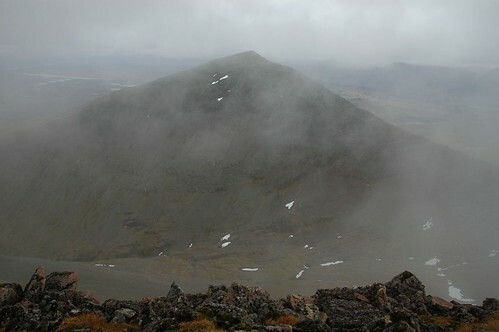 A fairly steady climb with a stop off for a cup of soup saw me gain the top of Meall a' Bhuiridh. I had spotted a herd of deer on the lower slopes and thought I could see some more further up, it turned out to be a walking club, a large group of about 15 people who had come up from Glasgow for the day. After leaving the top it was a bit of a drop then a rocky climb onto the main ridge of Criese. The mist was a bit up and down so the views were a bit restricted at times. 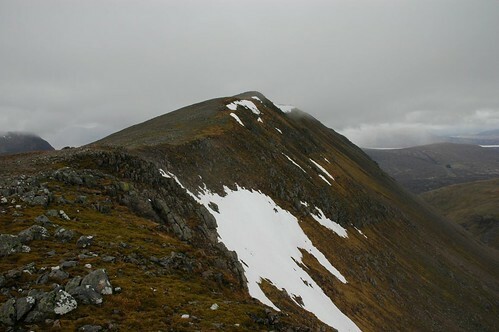 After dropping down off Criese, a short sharp climb took me onto Beinn Mhic Chasgaig. Part way up I stopped to chat to John and Martin a couple of guys who had arrived in Glen Etive that afternoon after a long drive up from Yorkshire, they were up in Scotland for a weeks holiday and a bit like myself had no particular plans but would play it by ear. We said goodbye not really expecting to bump into one another again. I strolled down the northerly slopes into Glen Etive and the banks of the river Etive and just across the river from where I had parked the car. After a bit of searching and not being able to find a suitable dry crossing place and not wanting to make to the long detour back to the road bridge again, I decided it was time to do a bit of paddling. So with my trousers off and boots attached to my rucksack I'm sure a made a lovely sight as I waded across the chilly waters in my boxer shorts. After reaching the car it was now a case of finding a camping spot. I drove further into Glen Etive and eventually ended up at Loch Etive. The weather had cleared and there were some nice views as the sun started to go down. The limited camping spaces on the loch shore were already taken so I headed back up Glen Etive to find a spot near the river. After putting the tent up and washing I settled down to my first camp meal of the week, Lancashire hot pot. It was a fairly cold night but I was plenty warm enough in the tent. I woke early the next morning and was up and out of my sleeping bag by six. The rain showers in the night had caused a slight dusting of snow on the mountaintops but this was soon to melt as the sun gained some strength during the morning. After breakfast I headed back down toward loch Etive and the start of my walk for the day. A footbridge meant for an easier crossing of the river at the start of my walk. It was a lovely morning and there was plenty of blue sky. 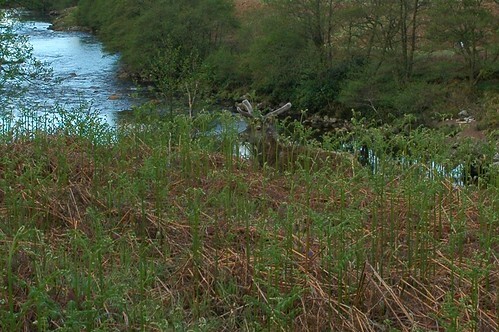 The path meandered along the river and past some deer lying in the under growth, it seemed that they must have thought it a bit too early in the day to be concerned about a passing walker, there was a cursory glance but no real intention of getting up. 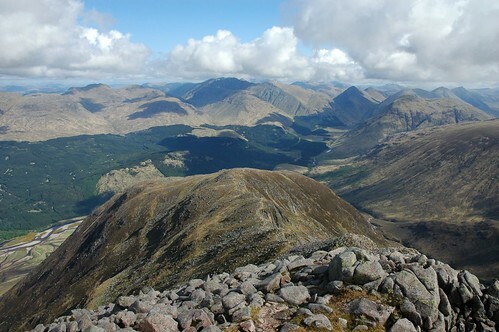 After three or four kilometers of walking and over one kilometer of climbing I eventually reached the top of Ben Starav after three hours. 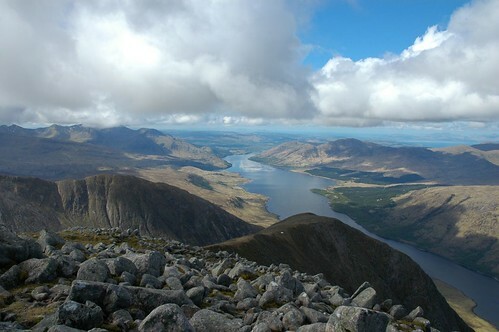 The effort was rewarded with some great views back into glen Coe and down the length of Loch Etive. 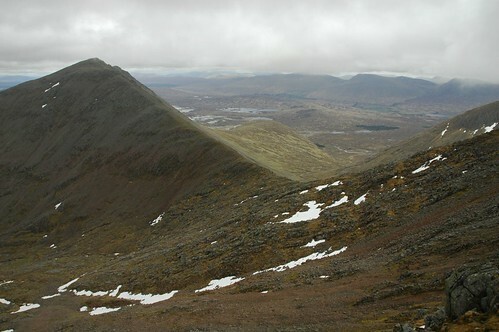 After enjoying a leisurely lunch I continued on my way walking around the skyline of Ben Starav then down to the 'saddle' between Ben Starav and Glas Bheinn Mhor. 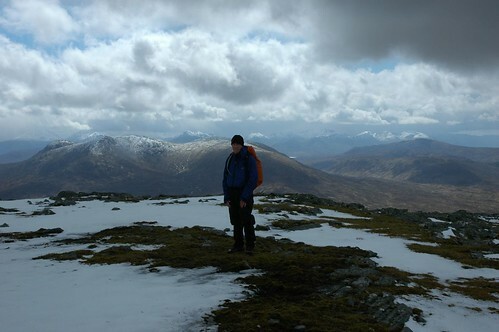 Before heading up Glas Bheinn Mhor I detoured out to climb Beinn Nan Aighenan. After retracing my steps back to the saddle and arriving on the top of my third hill of the day I was ready for a bit more to eat. As I reached the summit I met a couple of fellow walkers, two of only a handful I had seen all day, in fact after starting at seven it was the middle of the afternoon before I had spotted anybody at all. The walkers seemed a little familiar, I soon realised it was John and Martin who I had met the previous day. They were feeling the effects of the cool breeze so soon set off down the hill as I settled down for a sandwich. They had obviously taken their time descending as I meet up with them again down at the foot of the hill. We had a good chat as we covered the last few kilometers back along the river and to our cars. It turned out that we were neighbours, well in camping terms at least. They had picked a spot just 500m down the river from where I was. We finished the walk at six o'clock, it had been a long and tiring day but very enjoyable. The good weather was about to change, less than half an hour after finishing the walk the heavens opened and it rained solidly for an hour. I stayed in the car after arriving back near the tent waiting for an interlude in the downpour. The rain eventually stopped so I made a break for the tent grabbing my stove and food for my evening meal, a tin of beans and sausage with bread and butter have never tasted so good. After cheese and crackers and a wee dram I was ready for bed. A few heavy showers only slightly interrupted a sound nights sleep. Another cold night meant there was another thin layer of snow on the hills in the morning. The weather had cleared and I was a bit tempted to do another long walk but I thought that after meeting up with Stephan that evening we would probably be doing a long one on the 'morrow. 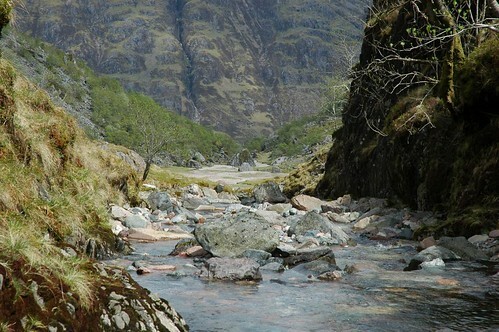 I opted for a leisurely day and a trip into the 'lost valley' of Glen Coe. Before setting off I popped along to say cheerio to John and Martin, they were in the middle of planning another walk in Glen Etive, probably up Buachaille Etive Mor. After removing the tent pegs and pushing the ends of the tent together I managed to fit it into the back seat of the car, a quick and easy way to pack up camp, I then set off on the short trip up to Glen Coe. 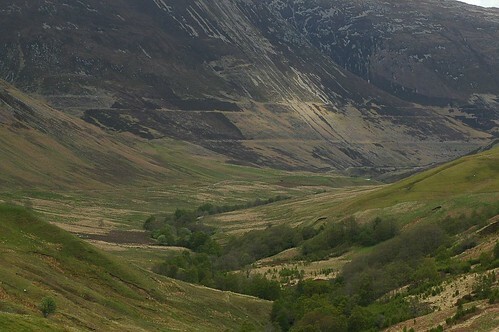 I had enjoyed a trip through the lost valley on a previous outing to the Glen Coe hills and was looking forward to visiting it again. 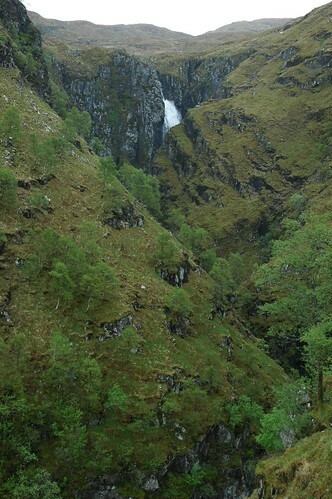 It took about an hour to climb up through the narrow gorge from the roadside car park. A good path, although reasonably steep in paces, winds its way up through the trees and across a couple of streams via some stepping-stones. The view opens out nicely at the top of the climb to reveal the secret valley and the upper slopes of Bidean Nam Bian in the distance. I had carried my stove up with me so enjoyed a nice chicken casserole for my lunch while sitting beside the stream that flowed down from the surrounding hills, I felt very comfortable and it was a bit of an effort to get moving again. 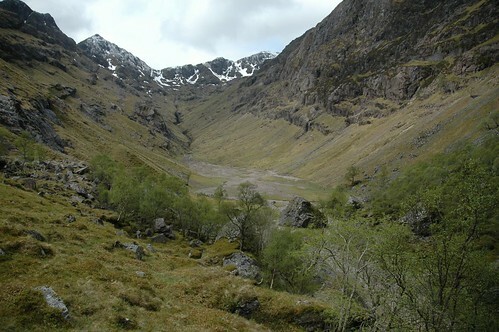 The Lost valley (or Coire Gabhail - Corrie of the Capture in Gaelic) has a long history. 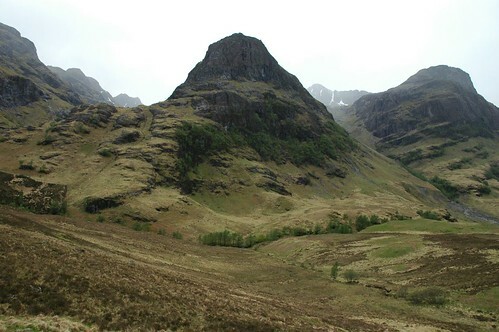 Apparently the residents of Glencoe, famed for their cattle thieving activities were reputed to have used it as a safe haven for the cattle they stole from richer neighbours. It's a good hiding place if you can figure out a way of getting them there in the first place. Even with today's good path I'm not sure that I could persuade a cow to make the journey. 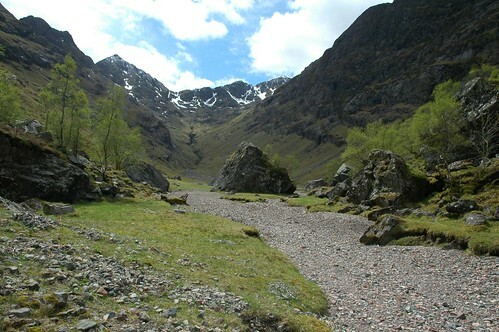 Back near the car park there are some great views of the three sisters and other Glencoe hills. 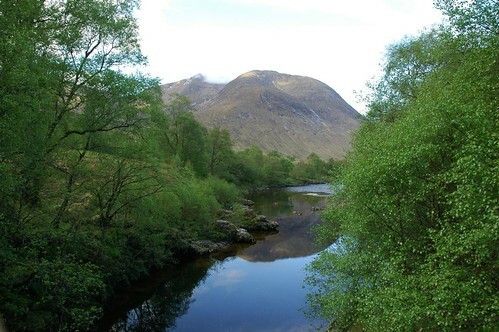 Glen Coe, also sometimes known as 'The glen of the weeping', is not without its lighter side. 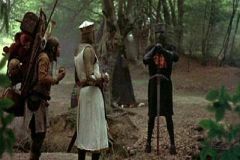 A narrow gorge near 'the meeting of the Three Waters' was the filming location for the bridge of death scene in the classic comedy Monty Python and the Holy Grail. Rannoch moor, just down the road from Glen Coe, also features in the film, as does Castle Stalker disguised as Castle Aaargh. Limited budgets meant that Doune Castle appeared under the guises of Swamp Castle, Castle Anthrax and Camelot itself. 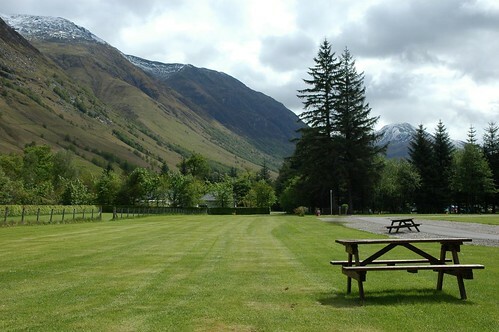 After leaving Glen Coe I headed up to the campsite at Glen Nevis in the shadow of Ben Nevis. I had arranged to meet Stephan here around six. I arrived a bit before Stephan so booked in and got the tent up, a very quick job after removing it from the back seat of the car still partly erect. Tuesday arrived with more showers, it had been really cold over night and an urgent early morning calling had revealed a white covering of frost on the outside of the tent. A fair covering of snow that stretched half way down the surrounding hillsides was revealed upon emerging from the tent for breakfast. We decided on a trip into fort William while waiting for an improvement in the weather. We popped into the local walking shop for post cards and a coffee in the adjoining café. Browsing for post cards I couldn't believe it, I had managed to bump into John and Martin yet again. They were having a day off and had come into town to replenish their food supplies. 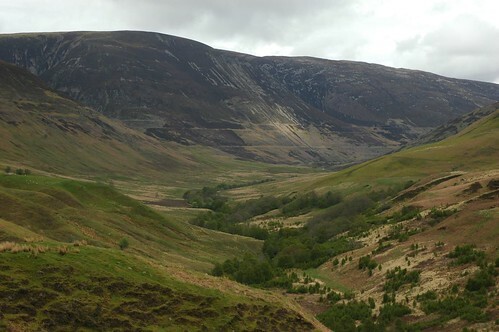 After arriving back at camp we got some gear together and decided on a short walk up in Glen Roy to see the 'parallel roads', about 30k east of Fort William. The road into Glen Roy climbs steeply past the parking area on the flank of Beinn a Mhonicag and the views north from here take in a considerable length of the glen and make a good place from which to appreciate this spectacular example of a landscape formed in the last ice age, Nothing like it is to be found anywhere else in Britain. The 'parallel roads' are perfectly parallel 'tracks' that run along both sides of the glen at heights of 260m, 325m and 350m. Long held in folklore to be hunting paths used by the Celtic warrior Fingal, they could equally be mistaken by modern eyes for forestry tracks. 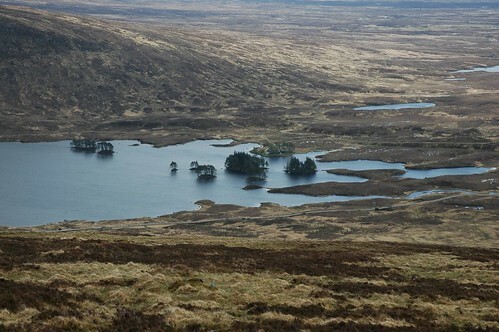 They are actually lines left by the shoreline of a vast loch that filled Glen Roy some 10,000 years ago, held in place by a dam of ice formed by the head of a glacier that advanced from the south west. As the glacier advanced, so the water it trapped in the glen deepened in stages, cutting shoreline ledges through wave action at each stage. When the glacier eventually retreated the water drained away, leaving the landscape as it is seen today. 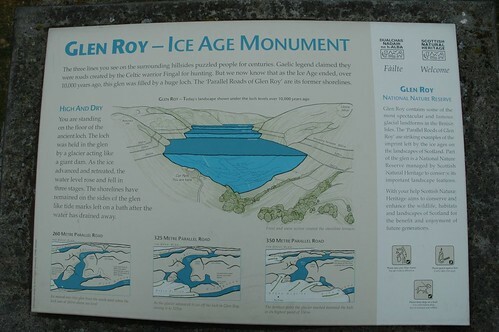 The scale of the changes wrought by the ice age is brought home when you realise that the upper lines are much higher than the parking area you are standing in and the glacier would have filled all of the lower land to the south and west of the car park. Wednesday started as the previous few days so we were a bit unsure of the best plan of action for the day. 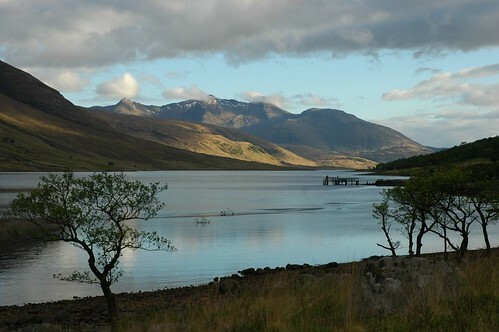 It was decided to head of to Tulloch to catch the train to Corrour station and walk back to Tulloch over Beinn na Lap. 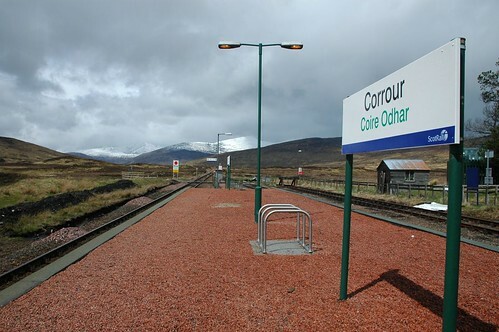 Corrour Station is Britain's most isolated train station - there isn't even a road to it. 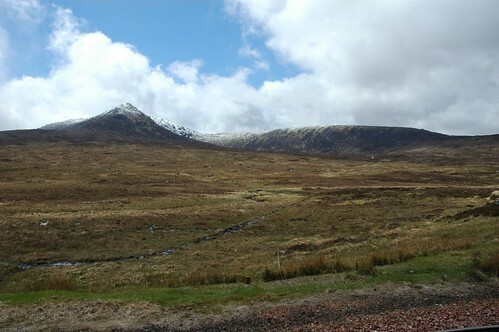 The builders of the West Highland Line from Glasgow to Fort William and Mallaig chose a different route from the roadbuilders, and for miles and miles the train crosses high moorland far from anywhere. 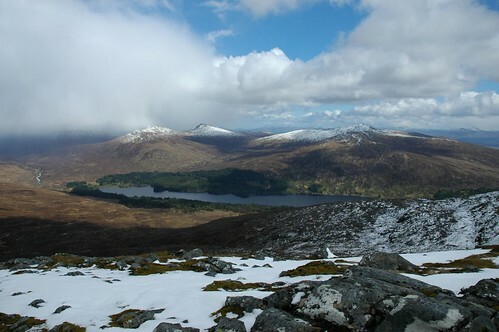 Corrour is the highest point on the line, and has a bothy at the station and a youth hostel about a mile away at Loch Ossian. Some impressive weather systems were crossing the area and we avoided one heavy shower before leaving the station and heading down a good track towards Loch Ossian. Nearing the loch we left the path and started climbing Beinn na Lap. Looking down we could just make out the youth hostel hidden in the trees at the end of the loch. Great views of the surrounding hills showed just how much snow had fallen over the last few nights. I'm sure the hills were probably bare of snow just a few days earlier. 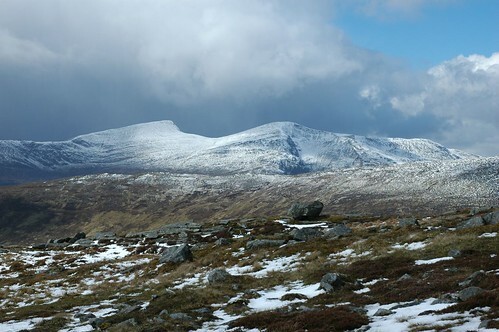 As we approached the top any precipitation falling came down as snow and combined with some gusty wind in places the snow was not so much falling but driving horizontally across the hillside, time to put on the waterproofs. Not sure if Stephan just likes bright colours or just likes to stand out but with his bright yellow souwester there was no chance of loosing sight of him. There were plenty of breaks in between the showers, which did afford some great views. 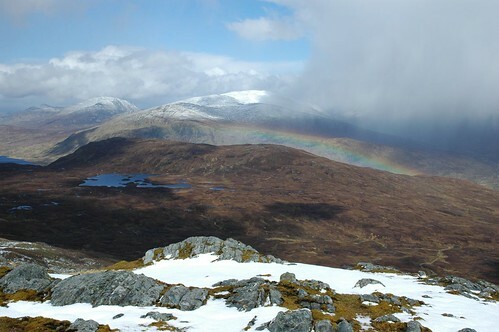 The changeable weather certainly added to the atmosphere and remote feeling of the place. 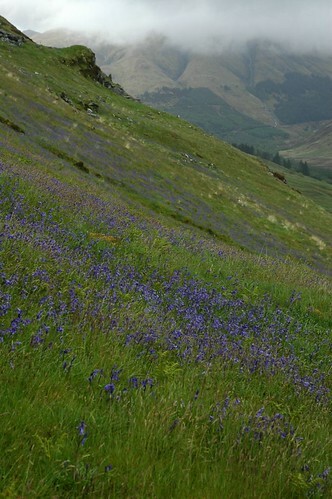 The weather continued to be unsettled into Thursday and so we decided to move camp up to Glen Shiel. We took our time heading up the shores of Loch Lochy just north of Fort William and along Glen Shiel to arrive early evening at our final campsite. Friday brought another rather miserable start to the day but the rain was intermittent and only fairly light. There would be no need to use the car over the last couple of days, as there was plenty of walking to be had from the campsite. One such walk took us over to the Falls of Glomach a three-hour jaunt with a reasonable bit of climbing. I'm not sure about the logic for this walk, we had seen rain every day and felt it on the tent every night but here we were putting in some reasonable effort to look at more water, and there was plenty of it. 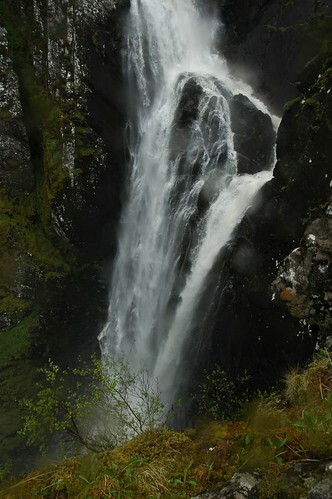 The falls proved worthwhile the trip, quite dramatic and with all the rain there was a good flow. 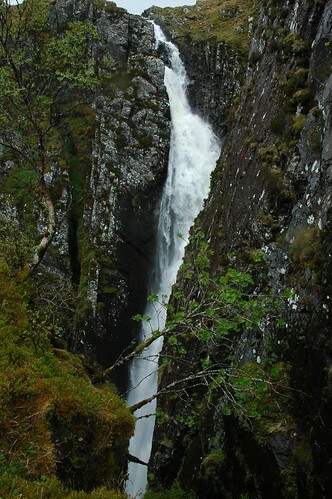 The Falls of Glomach is the second highest waterfall in Britain (after Eas a Chual Aluinn) at 113 m (370 ft). 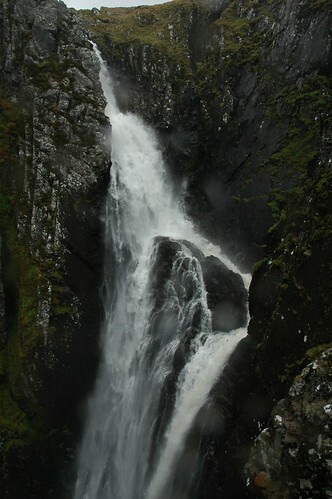 It does however boast largest single drop. 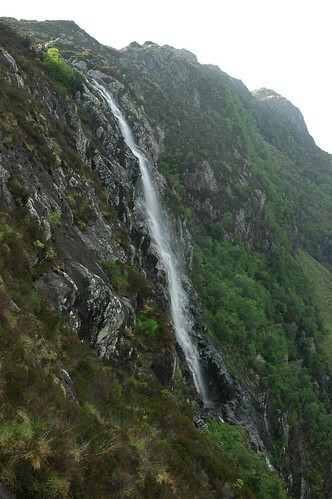 Eas a Chual Aluinn is Britain's Highest Waterfall at 200m (658 ft). 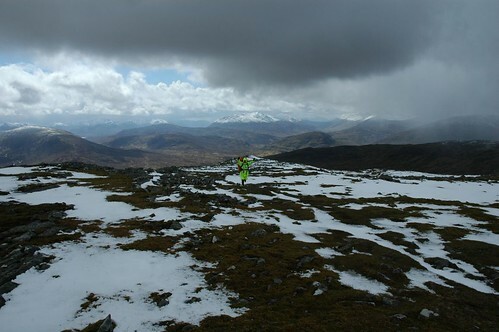 This picture was taken on a 'future' visit to Assynt (June 06). Saturday was our last day in Glen Shiel and we spent it walking up Sgurr an Airgid, situated within easy walking distance of the campsite. The weather was pretty changeable again but looked like the mist on the tops might clear at some stage. It proved to be otherwise and ended up being one of the wettest walks of the holiday. Sunday arrived and it was time to pack up and head back to Aberdeen. We took our time and headed up the coast along Loch Carron and through Torridon stopping at Achnasheen for a spot of lunch. All in all we enjoyed a good week with some good walking and plenty of fresh air, could have done with some better weather but at least we managed to get out most days.